Finding the best clipboards for nurses can be a bit of a challenge, namely because “best” anything is so subjective. However, narrowing the best clipboards down to a few key contenders can help the process. Keeping vital information safe and in one easy to get to spot makes clipboards an important tool for nurses. Even with electronic medical records in place, there are still many times when nurses need to jot down notes, store small items, and have a stable writing surface while standing or walking. Clipboards make that possible for even the business nurses. We’ve outlined some of the best clipboards for nurses in this comparison table to make it easier to find the one that is right for you. You can click the “Buy from Amazon.com” button to pick it up immediately. Here are some of the best clipboards that are sure to help any nurse stay organized. I love this clipboard. The quick reference material is designed by critical care nurses to give you quick access to some of the most important information for nurses. It has storage, which is my opinion is a must. Keeping your PHI safe from prying eyes is a HIPAA must! I also really like that the storage is detachable, so you can take it off should you decide you don’t want to carry the bulk for the day. It’s a great tool to help improve time management and organization. Pick yours up on Amazon. This clipboard is full size. It is made of a heavy aluminum, unlike many other clipboards that are plastic. Because of this, it is very sturdy and it folds up to fit in the pocket of a lab coat. It does take a bit of force to fold the clipboard, but it has helped eliminate accidental folding when it is in use. There is a clip at the top to secure papers and records. 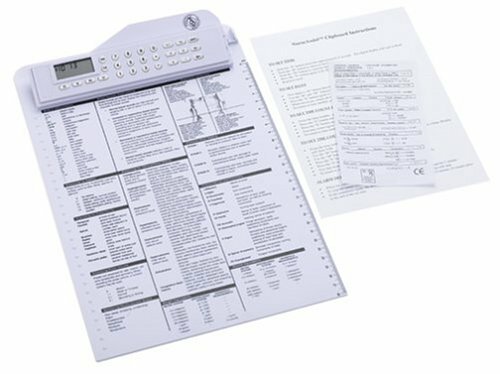 Another great feature about this clipboard, and one of the reasons it is one of the best clipboards for nurses, are the reference charts. There are easy access to conversion charts, grading of cardiac murmurs, eye dilation chart, normal lab conversions, and more. They are great to reference when completing patient assessments. You can also find this clipboard available in variety of colors. The cost for this clipboard is reasonably priced at around $30. Made of military tactical strength plastic, this clipboard is practically indestructible. The writing surface of this clipboard is quite large. It fits copy size and legal letter size papers. There is a clip at the top to hold papers securely while you write. There is also a removable light bridge on the top of the clipboard. Great feature for nurses who work the night shift. The storage compartment opens beneath the clipboard surface. It can hold everything a nurse needs from notes, tape, alcohol pads, calculator, scissors, and more. The clipboard surface props itself open when accessing the storage compartment, which makes it super convenient. You can get this clipboard for under $100. If you use an iPad at work, this clipboard is perfect. The foam padding is formed to keep an iPad secure within the storage compartment of the clipboard. It also has a space to store pens and pencils. The iPad is kept secure while the lid to the compartment doubles as a writing surface. There is a clip on the surface to keep pages secure. This clipboard price is listed at around $25. Currently, there is a 20% off coupon that can be claimed on the Amazon product page. If you are in need of a simple clipboard, this one is perfect. It has reference charts for a variety of resources including medical abbreviations. There is a clock, timer, and calculator built into the paper clip. The surface of the clipboard is also a dry erase surface. This clipboard provides a great way to jot notes or vitals down even when you find yourself without paper. This clipboard is priced below $20. Finding a clipboard that helps keep nurses on top of their responsibilities is important. The needs of each nurse differ from a variety of medical offices and facilities. Try to match features of a certain clipboard to the tasks that need to be completed throughout the nurses’ work day. Please share your experience with us. What do you think is the best clipboards for nurses? What clipboard do you use?